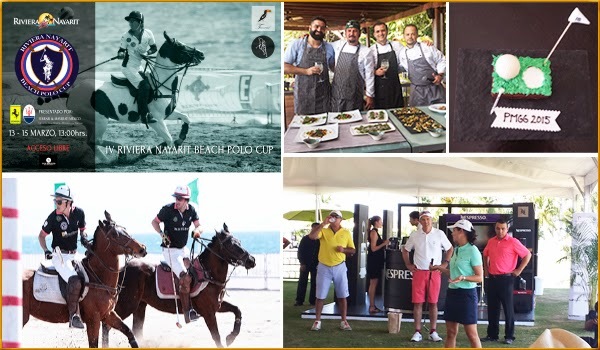 The coverage given by the national and international press that assisted the Beach Polo Tournament and the Punta Mita Gourmet & Golf Classic garnered approximately 4 million positive impressions for the Riviera Nayarit. The Riviera Nayarit Convention and Visitors Bureau’s Public Relations department organized FAM trips for the international and domestic press to target the Beach Polo Tournament and the Punta Mita Gourmet & Golf Classic. By taking into consideration the sum total of all the unique monthly visitors, the circulation stats and the social media followers of the specialized media invited to the Riviera Nayarit to cover these luxury events, the department calculates the events received approximately 4 million media impressions. C Magazine, FabFitFun.com, Chalkboard Magazine, Ocean Home and Jetset Magazine were on-hand from the United States to cover the Punta Mita Gourmet & Golf Tournament. Together, they offered a cumulative 800 thousand impressions. In order to maximize resources, several freelance writers were also invited. Mai Pham assisted from the United States; she is published in several top outlets, which together add up to over a million impressions: ForbesTravelGuide.com, HotelChatter.com, Houstonia Magazine, Local Houston Magazine and Dallas Morning News Travel. Irene Thomas and her ample connections in both the United States and Canada was also present. Among her outlets: Calgary Herald, Chicago Tribune, Denver Post, Miami Herald, Toronto Star, Travel Age West and Sunset Magazine. Bill Nestor was there for GoGolfandTravel.com, CigarAficionado.com and The Nature Travel Network. Several journalists from Brazil were also present, representing Avianca Magazine and Golf Life. ShortList.com from the UK and Mexico’s Grupo Editorial Televisa and Grupo Reforma rounded out the list. The Beach Polo Tournament was attended by Luxury Guide México; El Universal and its “Clase” section; the social editor for Quien; Los Rostros de Jalisco; the specialty magazine Players of Life and El Diario de Pueblo. This group represents a little less than one million impressions. Besides covering the tournament, the members of the media were treated to visits to San Pancho, Sayulita, Las Islas Marietas, La Cruz de Huanacaxtle and Nuevo Vallarta in order to expand coverage of the Riviera Nayarit’s microdestinations.